The fortification of the fort consists of main rampart broken at irregular intervals by round towers and rectangular projections. The walls are constructed with hewn Kangaroo stones of rectangular shape. The walls of the fortress are connected so that the outer wall which is lower than the other, which is extended to the inner wall, from a curtain of enormous thickness which cannot be affected by gun, spears and arrows. The upper parapets are built lined with brick work in which embrasures are cut. This is evidently the work of European engineers at a later period of fort's history. The narrow wall running round the fort can be reached by a flight of steps at the entrance of the fort. The main walls are built so strong with stones cut and filled together without mortar. On the southern side there is a raised bastion on which the flag staff stands and there are two small round towers raised on the main works at the south-east and north-east angles. The old entrance was by a wading roadway with massive gates and protected by a drawbridge, which was altered in the eighteenth century and adopted for defense by artillery. On the southern side there is also a postern which crosses the ditch at a low level provided with steps on its end. The Vellore fort is perhaps the most beautiful specimen of military architecture in South India and it is still in a good state of preservation. 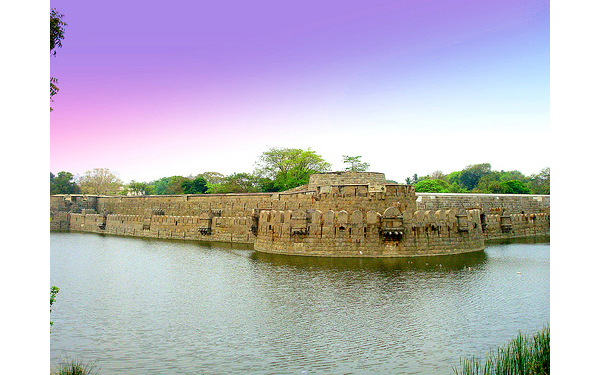 The broad moat which surrounds the fort receives water from Suryagunta tank, a large reservoir near the railway station. The most of yore, which boasted of more than 10,000 crocodiles, according to a local legend is no longer there. The moat is dry today on the southern side while parts of the eastern and western sides also face the same predicament. On its construction it was constructed for greater defensive purposes and it was built and made fairly wide and deep. The circumference of the moat is about 8000 feet at a length and depth of 190 feet and 20 feet respectively. The fort and the temple were selected for conservation by the A.S.I. Perhaps the moat served as the inner boundary and river Palar served as the northern boundary and on the eastern side, a fosse in the Madras, Bangalore highway at Sathuvachari along with the adjoining hills must have served as the boundary and the remnants of which are still found on the roadside. The temple and the fort were brought under the control of A.S.I. in 1921. The outer length of the fort is about 2500 feet and 1500 feet in breadth. The height of the outer wall is about 30 feet and the breadth is about 25 feet. The approximate circumstance of the fort is 2600 meters.